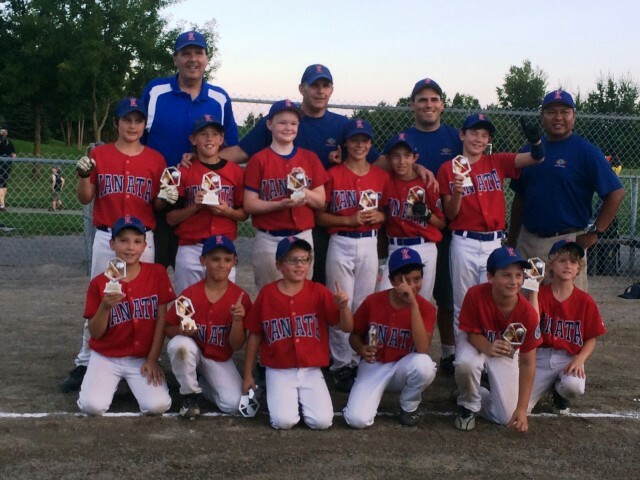 The Kanata Minor A Cubs completed a very successful Summer season. After winning the Kemptville Summer Slam tournament in late June, the Cubs went on to win the City Wide Interlock Final on August 25, crowning them City Wide Champions. Kayden Gnam drove in three of his four RBI with a bases loaded opposite field double in the second inning, Declan O'Kane pitched a complete game and stellar defense led the way as the Kanata Minor A Cubs won the City Championship by defeating South Ottawa 11-0. After a scoreless first inning, one which saw Ryan Dexter snag a line drive to his left at short, South Ottawa led off the top of the second with a single. A fly ball to left initially dropped was no problem for Eric Wilson who picked up the ball and threw a strike to second base, forcing the South Ottawa runner. A strike out and a ground ball to Hayden Pimm at second finished South Ottawa in the second and saw the Kanata bats come alive. Singles by Gareth Elmslie and Devin Cooney along with a walk to Ryan Dexter loaded the bases with nobody out. Two batters later, Kayden Gnam hit an opposite field line drive double to right which cleared the bases. A walk to James Harrison, RBI single for Eric Wilson and RBI double by Hayden Pimm pushed across the fourth and fifth runs and the rout was on. South Ottawa threatened in the top of the third by loading the bases. A single in between another nice defensive play by Ryan Dexter at short and two walks had South Ottawa with the bases loaded and one out. Two strike outs later by O'Kane, the inning was done and Kanata went back to work with the bats. Johnny Bonnar walked, a single to right by Peyton Hernandez and O'Kane being hit by a pitch, loaded the bases with nobody out. Michael McConnell then hit an RBI single, Gareth got another RBI the hard way by being hit by a pitch, another RBI single by Devin Cooney and a bases loaded walk to Kayden Gnam saw Kanata extend the lead to 10-0. Cue the defensive plays of the game in the top of the fourth inning. After South Ottawa got their first man on through an error, the next batter hit a sharp ground ball to second which Peyton Hernandez caught in full stride going to his right, two steps later, he forced the runner at second and a strike to first.........two pitches, two outs and the kids are going nuts. The next South Ottawa batter hit a soft line to the pitcher. O'Kane lost his balance and fell but still managed to catch the ball. In the bottom of the fourth, needing only one run to win, James Harrison led off with a single. One out later, back to back walks for Pimm and Bonnar loaded the bases for Hernandez. A single to left ended the game with Harrison crossing the plate, giving the Cubs the City Championship, 11-0.